To complement our ‘hands-on’ treatment we now offer Kinesio/k-taping. This revolutionary method - initially devised for treatment of elite athletes has entered the clinical arena and successfully supports and prolongs the effects of osteopathic therapy even for non-sporty people. Taping provides a way for the treatment to continue even AFTER you have left the clinic. 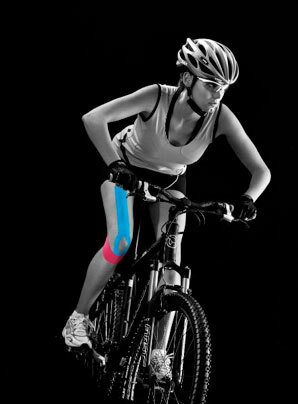 We also offer Kinesio/k-taping as a stand alone treatment. Kinesio/k-taping is a very gentle approach of therapeutic taping that is complimentary to osteopathy, integrative manual therapy, massage therapy and acupuncture. Developed and improved over the last 20 years it is now an important component of contemporary treatment methods. The taping technique is seen by many as a breakthrough in the management of musculo-skeletal problems which first saw it's world-wide exposure at the 1988 Seoul Olympics and many times since on the football pitch, cycling circuit and running track. It was the 'rage' during the London Olympics. If it’s good enough for David Beckham, it is good enough for you!! How can kinesio/k-taping help me? Kinesio/k-taping can be helpful for many conditions including muscle strains/tears, joint sprains/instability, bursitis, tendinitis, contusions, fascial restrictions and scars. It can be used in the treatment of back problems, neck and shoulder pain, muscle tension, joint dysfunction or disc problems as well migraine, common headaches and physical effects of stress and tension. Kinesio/k-taping can be used to improve muscle function, improve circulation, reduce pain and to support joint function. By increasing or decreasing muscle tension, imbalances within muscle groups are corrected. Kinesio/k-taping is an effective post-operative concept in lymphatic therapy, for example following breast cancer surgery, joint replacement operations and esthetic procedures. Kinesio/k-taping is now commonly used in the management of lymphoedema. Can I get an allergic reaction to the tape? The Kinesio/k-tape is 100% cotton with a slight stretch and an acrylic backing. This allows the tape to provide support without impeding the function of the muscle or joint being treated. It is safe for people with latex allergies as it is latex free but does contain silica. If you are worried that you might be allergic to the tape, we will do a 24 hour patch test for you. The tape can be worn in the shower or bath and for sports including swimming. It usually stays on for 4 to 7 days but can be removed at anytime if it starts to be uncomfortable. We use Kinesio® Tex Gold, K-Tape and Haddenham Kinesiology tape depending on application.